Fifty people wake up in a darkened room, only to find that one of them is killed every two minutes or when they attempt to leave. When they realize that they can control which person is selected to die, blocs emerge based on personal values. This movie was a pleasant surprise! 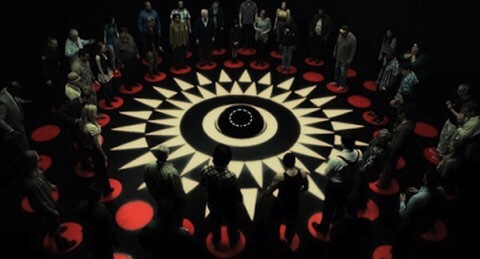 Circle has stuck around on Netflix for a while & I’ve seen a couple bloggers give it okay reviews but I’ve watched too many obscure Netflix movies that bloggers have liked & I’ve ended up extremely disappointed (Blue Ruin, Housebound, etc…). So I wasn’t sure I wanted to give this one a chance as it looked like it would be yet another terrible low budget movie that was never widely released in cinemas and that hardly anyone has heard of for good reason. Well, I’m glad I decided to watch Circle. I found the story fascinating & liked the simple way it was presented. It IS yet another obscure movie on Netflix with what appears to be a very small budget. However, the story makes it a totally worthwhile watch. In fact, I think the low budget helps this film as there’s no need for distracting special effects when you have such a strong story idea. Someone is killed every two minutes – it doesn’t get much more tense than that! FYI: this is labelled at IMDb as “Drama, Horror, Mystery”. Don’t let the “horror” thing turn you off as I really wouldn’t label it that. There’s no blood or gore whatsoever. “Psychological sci-fi thriller” would be a better description. I almost didn’t watch this partly because I thought it was more of a horror film. I won’t lie – this movie isn’t for everyone and some will hate it. It’s my sort of thing: A strong story that gets you thinking of the morality issues involved and how you would react in a similar situation. It feels like you’re watching a play as it all takes place in the strange dark room in the above poster. 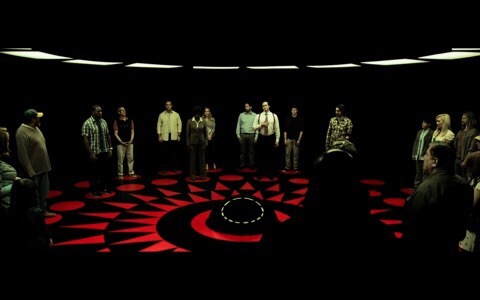 Each person isn’t allowed to move from their red circle on the floor – all they can do is talk to each other & try to figure out what’s going on and how to survive. Many issues are discussed such as: race, age, career, family, lifestyle, and what makes a person “good” & worthy of being kept alive as they all soon figure out that they’re able to control who the next person to die will be. Ultimately, they realize that it’s more a case of deciding who amongst them should be allowed to survive until the end. BTW, I LOVED IT!!!! saw it by recommendation last month and was immediately taken in by it all. I was very concerned abt the “horror” label, but in the end there was absolutely no horror what-so-ever in it. It kinda made me think of a super (survivor) Tribal council. Check out my review if u’d like mutant! Oooh! I’ve never heard of this, but it sounds really interesting. I’m glad it’s not really a horror as that would definitely put me off. This is going straight on my watch list – great review! Sweet! I’ve been wavering on watching this one for MONTHS now (for a couple of reasons), but I think you’ve convinced me! Thanks for the kind review Table9Mutant and for giving it a chance. Appreciate all the nice comments. Really enjoyed this, very much my kind of film. Coherence is definitely worth a look, too. Quite different, but also touching on some similar elements of psychology, I think. Circle kind of uses its setup to be a thriller, whereas I’d say Coherence is more about the possible implications of its scenario… if that makes sense. I really did! : ) Is it one you’ve seen too?? I’ve been wondering about this one. Looks like it is worth a watch. I have this one in my list but have been flip flopping on the idea of watching it. You just convinced me to go ahead and put it on tonight. I thought it sounded a little like the Exam. But I was not sure how I felt about everyone dying until there is a last man standing. Strange, given I’ve watched other movies with that concept. Definitely worth a watch! I hope you liked it if you did watch it. : ) That’s funny – I was going to compare it to Exam then forgot to. 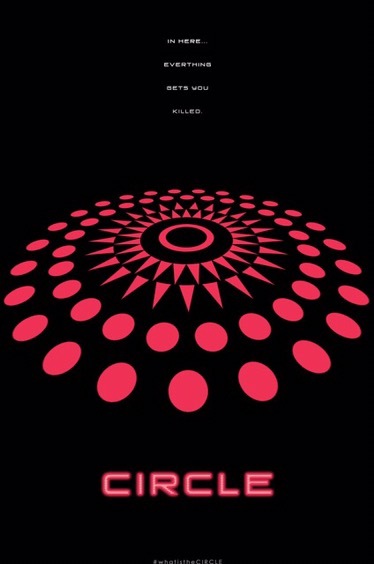 I was reminded of Exam but think Circle is the better film overall. Exam started strongly then went downhill.